Twice a month, NewsCenter1 and First Interstate Bank team up to find a teacher who goes above and beyond for their kids. The teacher gets a $500 grant to help them in their work. 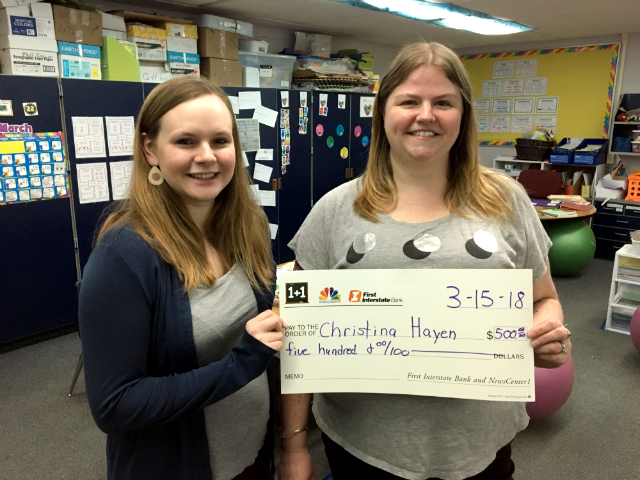 This week’s recipient is third-grade teacher Christina Hayen of Grandview Elementary School in Rapid City. Her students, whom she affectionately calls “Hayen’s Minions,” are like any other group of third-graders. They are full of life and energy, and sometimes it can be a challenge for them to sit and focus on their schoolwork. Hayen recognizes that there is never a one-size-fits-all solution and would like to offer her students new seating choices. Hayen wants to provide a more comfortable and customized sitting environment for her students. She has provided a few choices, mostly on her own dime. Hayen wants to purchase some wiggle seats, stools, and directors chairs. Presenting the grant is exciting for First Interstate Bank Loan Processor Ellyn Vogel. Hayen was happy for the help in serving her students. “Without the support of the community, and places like [NewsCenter1] and [First Interstate Bank], we wouldn’t be able to provide for our kids the way that we’re able to with this,” Hayen said.